Australian Catholics for Equality are members from the diverse spectrum of Australian society that celebrates the gifts and the lived experiences of Lesbian, Gay, Bisexual, Transgender, Intersex, Queer (LGBTIQ) Catholics as part of our lives. Our journey as faith-filled and faithful Catholics from this rich tapestry of experiences and backgrounds, calls us to seek equality and justice with LGBTIQ citizens in our church and society. Ignorance and bigotry have often dominated the conversation of what it is to be Catholic and LGBTIQ, and mainstream Catholic media often does not acknowledge the lived experiences of LGBTIQ Catholics, our families, friends and our allies. We're lifting our voices together, running campaigns on multiple issues that effects the lives of LGBTIQ Catholics, their friends, family and allies. Partnering with community and advocacy groups in bringing together forward thinking Catholics from all walks of life to pray and work for our shared humanity, toward peace with justice. Vatican-II tells us that the people of God is what makes us church, people in loving relationship with one another building peace with justice for a better world. $10 will help us reach 500 Catholics over social media. $50 will help us pay for our monthly website and administration costs. $100 will help us is assist us tell our stories to another community. $250 will allow us to run forums in our local communities. $500 will pay for the cost of a local news advertisement. 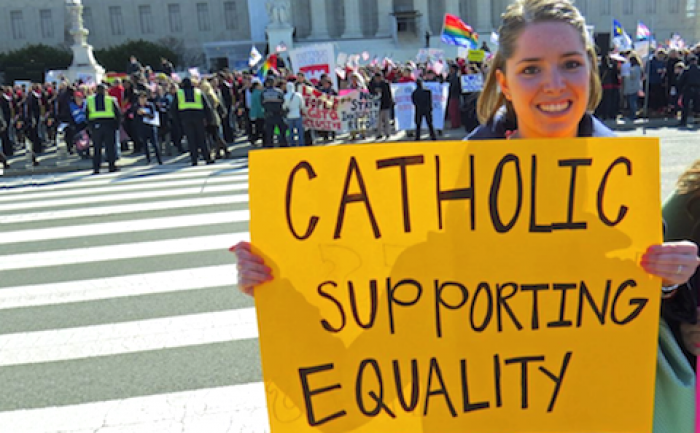 LGBTIQ Catholics, our families, friends and allies are coming-out! We are lifting our voices together, telling our real stories and advocating for change in our society and our church!